To receive a message when we start taking orders for apples in the fall, sign up for our emails. What are Honeycrisp apples like? 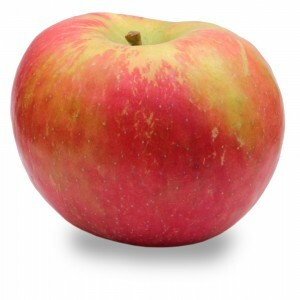 The Honeycrisp apple is a gourmet apple with a complex, sweet tart flavor. If you love that “C-ch” sound when you bite into a fresh apple, this one is for you! The Honeycrisp’s flesh is very crispy-crunchy and very juicy. Honeycrisp apples are perfect for eating fresh, salads, applesauce, cider, baking, and pies. Are Honeycrisp apples good for storage? They’re so-so for storage. Although some people rave about Honeycrisp apples for storage, it’s been our experience that it the later-ripening apples are better for long-term storage. These apples are grown by a family that we’ve worked with for several years now, and we’ve never been disappointed with the quality of their fruit. As is the case with most of our other ‘conventional’ fruits, these apples are grown using a method of farming known as Integrated Pest Management, which makes it possible to spray minimally. Frozen apple slices – great for pies, sauce, cakes, smoothies, and crisps. Cortland apples work well for freezing because they tend not to turn brown. Here’s a handy apple chart that shows which apples are best for what purpose. I would like to get some prices on the honey crisp and mutsu apples for next year or whenever you have them.